Earlier this year I came across the website Volatility Made Simple. Much like our goal at Trading Volatility, Volatility Made Simple's goal is to help less informed investors understand and take advantage volatility ETPs in a manner that is similar to how large institutions trade volatility. What is really great about Volatility Made Simple, is that at the end of each month the performance of various volatility trading strategies is recorded. As of the November update there were twenty different strategies on the list, and according to him, they represent the vast majority of volatility trading strategies of traders timing these products. Below is his image which illustrates the November performance of strategies compared to XIV buy-and-hold. The other nice thing is that he will occasionally write posts which independently examine each strategy in depth, identifying the exact trading rules and performing backtests to 2004 to see how they perform under a variety of conditions. This is useful to make sure that a strategy is not just optimized for ideal markets but can also perform well in more turbulent environments. In addition he also provides statistics such as percent winning/losing trades, average trade return, and sometimes the max drawdown percentage and Sharpe ratios. Below I will post several of the charts from his site. From $10,000 to $1,200,000 -- that's a a 12,000% return in 10 years! That's remarkably impressive. Wow. So should we be issuing a scam alert? A 100,000% return over 10 years?!? GET REAL!! Too good to be true, right? Except that these strategies are all valid. The average investor who just buys index ETFs or scours the stock market looking for the hottest stocks in a struggle to outperform the S&P 500 (or just break even) will completely dismiss these returns as impossible. But for me, VIX and More, Market Sci, Trading The Odds, Volatility Made Simple, and all the other people who have developed one of these volatility strategies, these returns are real (Note: None of these people are aware that I'm writing this, they have no connection with the Trading Volatility site, and do not necessarily agree with or endorse anything I'm writing). How do I know that these ridiculous returns are likely to be legit without independently verifying them for myself? 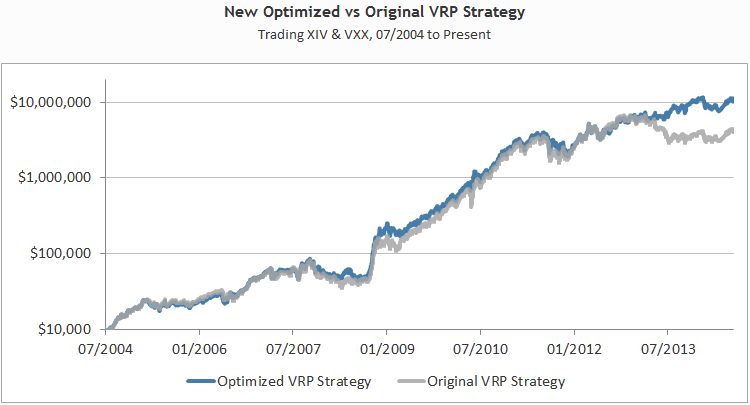 Because our VXX Bias strategy is right in the ballpark with the leaders (performance summary for our VXX Bias strategy can be found here). When you look at the return over the entire period it seems astronomical. But actually this just demonstrates the power of compound interest. A portfolio of $10,000 that grows at 90% per year over 10 years is worth $6,131,066.26, which is roughly what the best strategies return. The trick is being able to average 90% per year while avoiding major drawdowns. When I tell people about my strategy and the returns that can be achieved, everyone skeptically asks, "Why aren't other people doing this?" The answer is "THEY ARE!" Volatility Made Simple tracks a handful of strategies that have been made public. From what I can tell, and as VMS points out, most of the strategies apply similar concepts. Each strategy has its own strengths and weaknesses and many struggle through the same conditions. Because of certain optimizations, some strategies manage to excel over shorter time frames under certain conditions. However, over the years it's easier to see the order of magnitude of difference among the different strategies. I'd argue that a blend of two or three of the top strategies would be the best way to reduce variation in returns, however this may not be cost-effective for smaller accounts. There are many other confidential volatility strategies out there. They belong to the smart money managers and institutions who are making money hand over fist. And the best part is that it doesn't matter if it is a bull or bear market. 2008 financial crisis? Not a problem -- in fact, a good strategy flips to buy volatility to take advantage of a steep market decline. The fact is, volatility ETPs are generally giant scams designed to separate unknowing investors from their money. VXX and UVXY are obviously horrible over the long term but can go up 10x in a matter of months. Inverse volatility (XIV) looks good most of the time but is prone to 80%+ drawdowns that can wipe you out. People who understand how these products work can exploit their flaws to generate giant returns. 1) Find a signal-based trading plan that matches your style and fits in with your financial objectives. Make sure the strategy has signals that make it easy for you to follow. 2) Strictly trade based on hard rules. This will allow you to avoid making emotional decisions and fighting the trend, and will maximize long-term results. 3) Understand that day-to-day, week-to week, and month-to-month performance can result short-term negative returns. Don't lose focus of the long term. 4) You will have losing trades. This is why we focus on process and probabilities, not short-term outcomes. What matters is the process and patience. 5) If you are not able to follow rules, don't trade. Sorry to say, but if you can't find the discipline you don't get the profits (and you probably shouldn't be trading at all). Most of the strategies on VMS's summary are similar in that they assess market conditions at the end of each trading day to determine if a buy or sell is necessary. They are also similar in the number of trades per year, typically between 7 and 30, making these strategies fairly manageable swing trades which do not require the investor to be glued to a trading screen all day. When it comes down to it, I don't really care which strategy you choose as long as you are successful. It's just time to stop being one of the many unfortunate who are on the wrong side of the trade. If you'd like more information on the Trading Volatility Bias strategy please visit this link. Our Bias indicators are automatically emailed at the end of each trading day and our Bias change alerts notify subscribers whenever the Bias changes direction, making it easy to follow. Our subscriber services are available for less than $3 per day making it very affordable. 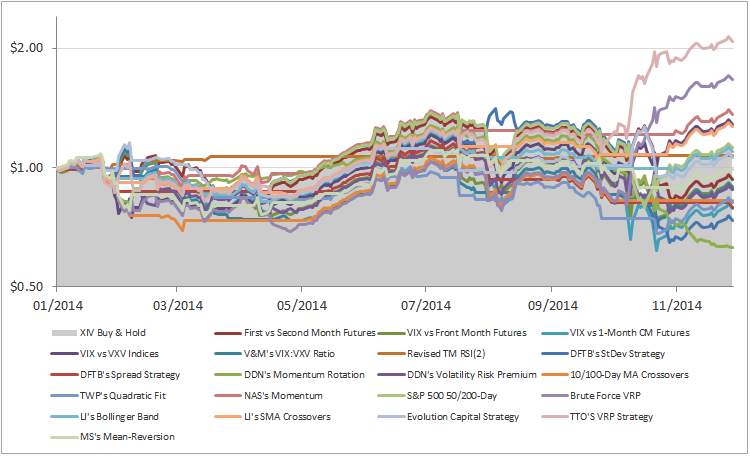 You can also take advantage of our free VIX Futures Data pages as well as our SPY Arbitrage and Pivot Point tools. And if you have any questions at all, feel free to reach out to me via the Contact page.